Word of Mouth Marketing (WOM) is undeniably powerful. I’ve written about the power of WOM in the past (Boar’s Head, Pabst Blue Ribbon, etc.) and I still believe that organic word of mouth is one of the most powerful ways to grow your business. And that’s especially true for small businesses. Well, a few weeks ago I was able to see an example of how one business could foster positive WOM and then how another company could generate negative WOM, and all in 10 minutes on a Saturday morning. Yes, I keep a keen eye out for things like this, but it was amazing to see how I could feel so good about one company and then so bad about another in such as short period of time! After I got home that Saturday morning, I started to think about my two experiences and wanted to share them here. I’ll break down both experiences and then give you some questions to think about regarding your own company or business. I’ve been going to Windsor Cleaners in Princeton, NJ for a number of years now. I’ll start with some some basic reasons why I go there. First, they provide an outstanding service. I know, a novel idea, right? Providing a great product or service is obviously the foundation for generating positive WOM. Next, they provide excellent customer service. Third, they go the proverbial extra mile for their customers (which is more than just providing excellent customer service and you’ll read more about this below). So for me, Windsor Cleaners is starting with a solid foundation. In all the years I’ve been taking my clothes there, I have never left unhappy. In addition, they know me as soon as I walk in the door, entering my account number in their system without me having to say a single digit. I like that. I also typically bring my kids with me when dropping off my clothes, and the employees at Windsor Cleaners are always great with them. And you can tell it’s genuine, and not the BS, “oh how cute” that you hear from some people. So in a nutshell, they provide a great dry cleaning service and provide excellent customer service. Now for my Saturday morning story. A few weeks ago, I walked in holding my 2 year old son in one arm, a pile of clothes in another arm, and I was in a hurry. I also brought in one of my winter jackets during this drop off, and I quickly checked my pockets to make sure I wasn’t forgetting anything. I received my ticket, said goodbye and was on my way. I ended up taking my son to another store in the same shopping center as Windsor Cleaners. So I’m on line in the store and someone taps my shoulder. It’s one of the women from Windsor Cleaners holding my $225 pair of sunglasses. I must have left them in my coat. The woman from Windsor Cleaners tracked me down (without knowing where I was going) to make sure I had my sunglasses. That’s awesome. How easy would it be for her to just put them aside and wait for me to come in next week? Or worse, how easy would it be for someone to just take them, right? The people at Windsor Cleaners never would, but I can’t say that for everyone in this world… This was a great example of a small business going the extra mile and fostering positive word of mouth. In my opinion, Windsor Cleaners is doing everything right as a small business. They provide an excellent dry cleaning service, they are nice to their customers, their employees seem happy, and they go the extra mile for their customers. Why wouldn’t you like them?? By the way, they aren’t the least expensive dry cleaning business in my area. But I don’t care. It would take a lot to get me to stop going to Windsor Cleaners… And as I’ve said in previous posts, I’m a WOM machine. If I like something, you can’t shut me up about it. I blog about it, tell people at work, tell my friends and family, etc. So, you bet I tell people about Windsor Cleaners. It’s easy… I want them to succeed. I pulled into Jiffy Lube to simply get a fast oil change and be on my way. I got out of my car and entered the building, and then waited for someone to check my car. It wasn’t long before I heard, “Mr. Gabe, please follow me.” and that’s when my stomach turned… I’ll stop for a second and ask you if you already know what I’m referring to? I bet some of you do… Actually, I know some of you do (more on that soon). Are you ready for a Jiffy sales pitch? And the game begins… I’m holding my 2 year old son and I follow the person from Jiffy Lube out to my car. Now I’m in front of a monitor in the middle of Jiffy Lube’s garage. How nice. :) In a matter of seconds, you are being pitched all sorts of products and services for your car, from the infamous air filter, maybe a cabin filter, something about your fuel injectors, and then some type of engine flush. Really?? First of all, if I was to have something like that done, it probably wouldn’t be at Jiffy Lube. They rush you through the process, hoping for the uncomfortable, “ok, I guess so”. They pull out your air filter to show you how “dirty” it is, and push you just hard enough that you feel like you’re being swindled. I hate that feeling, and I hate their process. They point to the monitor and show you some data about how your car hasn’t gotten this in six months or how you haven’t done that in one year. And of course they don’t tell you pricing while taking you through all that’s wrong with your vehicle. You actually have to ask for pricing (if you’re even lucky enough to retain half of what they threw your way.) I hear this pitch every time I get my oil changed, and to be honest, I’m tired of it. The process I just explained above is where Jiffy Lube goes wrong. I don’t feel confident that I need most of what they are pitching. Do I need some of it? Probably so, but it doesn’t matter. I don’t trust them. I don’t know if I’ve ever witnessed a process that makes me feel so negative, so quickly. Then you’re forced into the awkward situation of declining what they just rattled off, and it’s even a little embarrassing. I can’t imagine that anyone at Jiffy Lube would want it to go down this way. Do you? Does Jiffy Lube provide a good oil change service? I think so. I’ve never really had a problem. Their pricing is ok and their employees are generally nice. But, I don’t get a good feeling about going to Jiffy Lube. I think it all comes down to the cheesy sales pitch you get every time you bring your car in… Does anyone in marketing at Jiffy Lube understand how this impacts their brand? I don’t feel loyal to Jiffy Lube. Actually, I could go somewhere else for an oil change 3000 miles from now and not even give it a second thought. By the way, if you’re thinking that an additional air filter can’t generate a lot of revenue, you’re wrong. Start doing the math based on how many locations they have any how many estimated customers get oil changes each day. It sure adds up, but at what long term cost to the company? Jiffy Lube might have generated an extra $20 this time, but what if they lose my business forever? That would be thousands of dollars that Jiffy Lube would stand to lose (and just from one customer). I’m not the only one that feels this way. I found out that many others feel the same exact way. I tweeted about my last experience on Twitter and received some quick replies and direct messages from others that don’t like the process either. It’s funny, I didn’t mention what was pitched and their messages all revolved around the air filter sales pitch! I found that interesting…so I started doing some Google searches. That’s when I found this. Oh yeah, and this, this, and this. Uh, an entire site dedicated to Jiffy Lube problems and it ranks #1 for jiffy lube air filter? (see screenshot below) And there were dozens of more listings too. 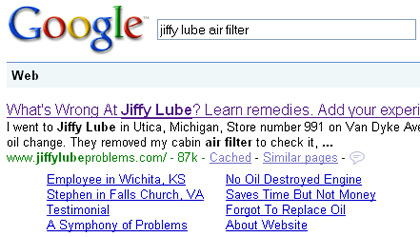 By the way, enter Jiffy Lube Air Filter in Google Blog Search. You’ll find some interesting stories. Let me tell you, if I worked at Jiffy Lube, this would be one of the first things I fixed. They seriously need a Customer Service Czar, and now. Someone who comes in with guns blazing and fixes this problem. The power of WOM is undeniable, but the fact that Jiffy Lube has a reputation management problem is also undeniable. It actually makes me wonder what’s getting in the way of fixing the problem… So, the next time you hear a pitch for an air filter at Jiffy Lube, think twice. Maybe you need it, but maybe you don’t. 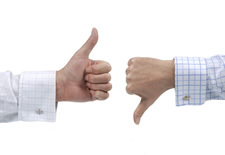 Is there any part of your business that actually annoys your customers? Do you help generate negative word of mouth? Take a hard look at all your customer touch points, ask your customers for real feedback, and change anything that can be generating negative word of mouth NOW. So I think it’s clear that Jiffy Lube can learn a lot from Windsor Cleaners about customer service. But more importantly, how much can you learn from them?